BUFFALO, N.Y. — Roswell Park Comprehensive Cancer Center ranks among the top 3% of cancer centers nationwide, as assessed by U.S. News & World Report. The Buffalo-based center moved up three spots, to 30, on the media outlet’s annual list of 50 Best Hospitals for cancer and was also recognized as high-performing within two subspecialties: colon cancer surgery and lung cancer surgery. One of only five New York State centers to make the top 50, Roswell Park once again stands as the only facility in all of Western and Central New York to be named a Best Hospital for cancer. The annual Best Hospitals rankings, which are based on factors including hospital volume, nurse staffing and other aspects of the hospital environment, are designed to help patients make informed decisions. In compiling the 2018-19 Best Hospitals–Cancer list, U.S. News compared data for 889 eligible cancer hospitals. Only 158 hospitals among more than 4,500 centers evaluated nationwide were ranked in even one of the 16 main specialties this year. Click to open full sized image in a new window. Roswell Park received the maximum scores in areas including patient survival, advanced technologies and patient services. 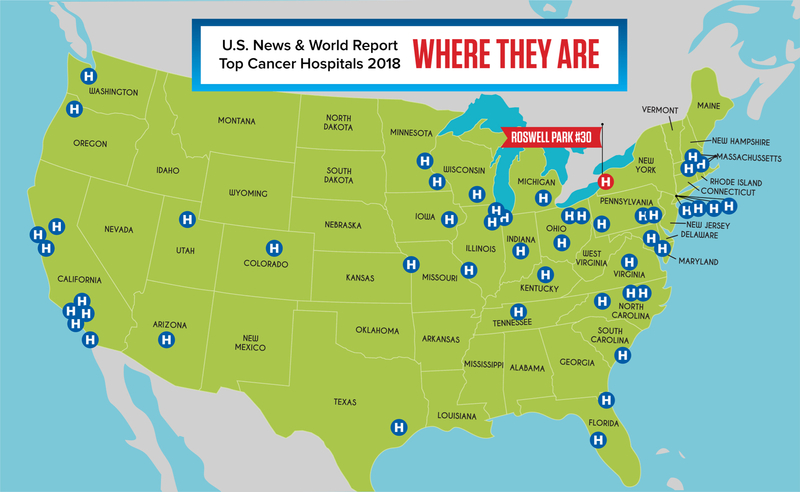 “You have to be good at a lot of things to even place among the top 50, so for Roswell Park to keep moving up the list affirms that we are providing care that measures up to the highest national standards,” says the cancer center’s President and CEO, Candace S. Johnson, PhD. Roswell Park has been honored by many organizations for the quality of its care. In addition to its status as a U.S. News Best Hospital for cancer, the cancer center has been recognized by the BlueCross BlueShield Association as a Blue Distinction Center for Cancer and received Guardian of Excellence Awards for patient satisfaction from Press Ganey Associates for each of the past three years. For more information, go to roswellpark.org/quality/designations. See the full 2018-19 Best Hospitals rankings at health.usnews.com/best-hospitals.